Week 2: How can you turn stories into a novel? Last week we learned the definition of linked stories; this week, we tried to figure out just how, exactly, you might go about linking stories. Short stories are inherently different from novels—they aren’t long enough to let you enter the vivid, continuous fictional dream of a novel, nor are they plotted in the same way. So, to better understand how we might transform and link short stories into a novel, we took a look at Raymond Carver’s Short Cuts and Robert Altman’s film version. Short Cuts is a collection of nine stories and a poem by Raymond Carver. The book was actually compiled by Robert Altman and released to accompany his film by the same name. In their original form, Carver’s stories are all unconnected, seemingly disparate works; so in watching the film, we looked for the ways in which Altman was able to connect these stories. Our class was divided into two groups: Group A watched the film first and then read the story collection; Group B read the book first and then watched the film. So—what was the purpose of that? Group A came to the film with no prior knowledge except that it was based on a book of short stories. We viewed the connections between the stories without judgment, and we even voiced the opinion that there should have been more connections—more character overlapping, more themes drawn through the whole movie. Group B came to the film having already read the book. They knew these stories were not originally about any of the same characters, and so the connections seemed forced at times. Of course, the opinions were not unanimous or exclusive; Group A saw forced connections in the film, and Group B saw places where the connections worked well. Part Two of the learning activity happened while we each watched the film. Group A took note of the characters in each scene. Group B took note of the source stories in each scene. 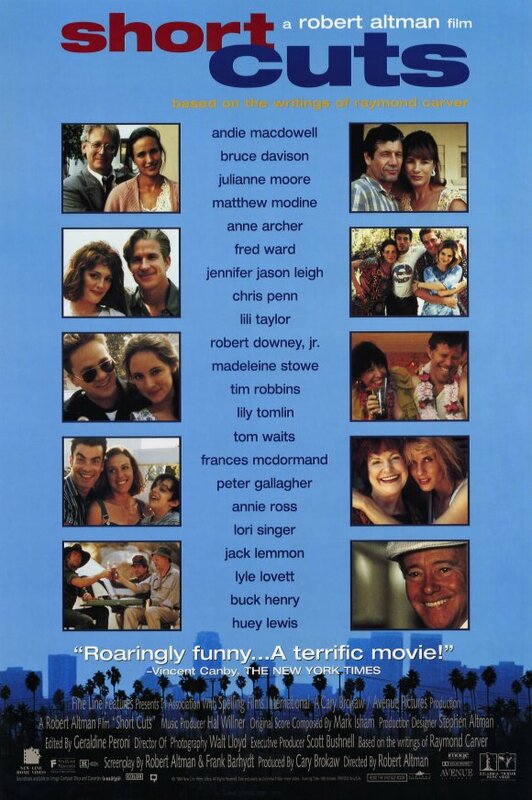 By looking over these lists, we were able to find the places where Robert Altman layered stories on top of one another, merged characters and storylines, etc. 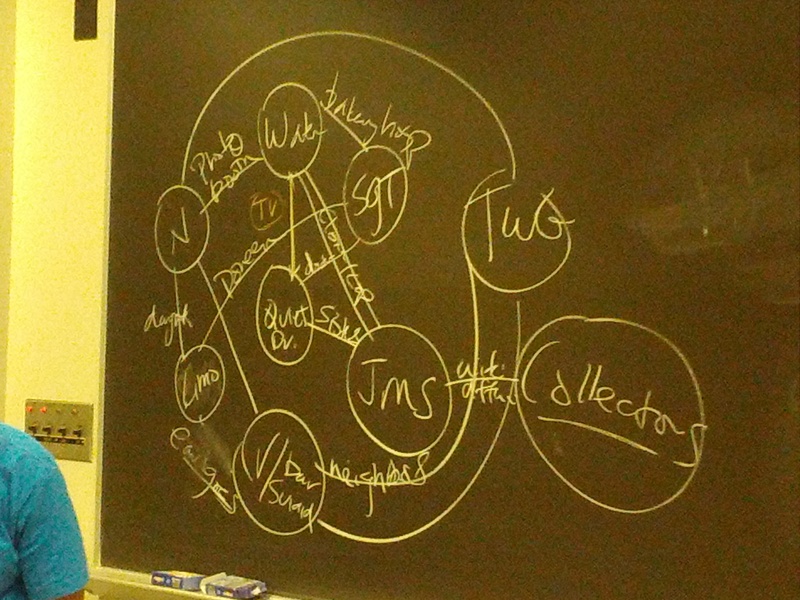 We then drew a map on the board, with lines connecting the source stories. For example, Doreen the waitress is from Carver’s source story “They’re Not Your Husband,” but she also plays a critical role in Altman’s version of “A Small, Good Thing.” So we drew a line between those two stories with “Doreen” as the connector. Each circle is a Carver story. Each line represents a recurring character or place that links the stories in the Altman movie. Here’s a much better attempt to “map out” all the links in Short Cuts. There are several plotting devices you can use to transform stories into a novel. In transforming Cathy Day’s The Circus in Winter, a collection of short stories, into a musical, Ball State students decided to condense the clock of the story from one hundred years to just one. This is because novels, films, and plays often take place in “real time”—or at least a short, continuous span of time which allows us to enter the fictional dream of the work. Character arcs, throughlines, subplots, and plot layers can also help you turn stories into a novel. These devices are similar, in that they all help to pull the audience through the longer story. Weaving layers and subplots throughout your stories helps you to create nodes of conjunction or tighter plotting. We learned about several plotting devices you might need to make use of in order to transform a collection of stories into a novel. You might feel that using these devices force the story into something “unnatural”—something different from the story in your mind. So you ultimately have to make a choice between what’s more important: your own conception of what the story is, or turning the story into a novel which gratifies your readers.